This week's Top Ten Tuesday topic from That Artsy Reader Girl is Ten Books That Awaken the Travel Bug. I love vicariously traveling through my books and these are some of my favorites. 1. 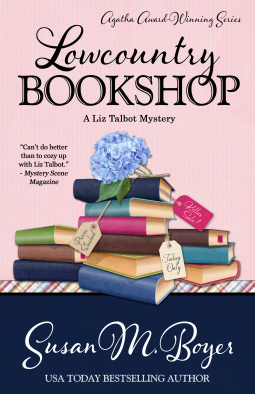 Lowcountry Bookshop by Susan M. Boyer - This book reads like a tour guide to Charleston, SC in the best possible way. I wanted to book my trip immediately after reading this. 2. Anne of Green Gables by L.M. Montgomery - This is the book that put Prince Edward Island in Canada on my top ten travel list. All the descriptions of the landscape are too gorgeous to resist. 3. The Tuscan Child by Rhys Bowen - To be honest Tuscany has never been high up on my travel list until I read this book. Just the food mentions made me want to book my flight. 4. Stars of Fortune by Nora Roberts - After reading this I need to go to Corfu. I mean without the avenging demons and whatnot of course. 5. The Road to Little Dribbling by Bill Bryson - This book made me want to go to England for two months and go on different wanderings through the countryside. 6. We'll Always Have Paris by Jennifer Coburn - This memoir about mother/daughter travels didn't actually make me want to go to Paris even though that's what is in the title. It did make me want to go to Spain which was another stop on the trip. 7. 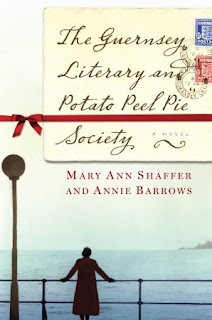 The Guernsey Literary and Potato Peel Pie Society by Mary Ann Shaffer and Annie Barrows - To be honest I never thought anything about Guernsey other than in connection to the cows ntil reading this book but now I'd love to visit! 8. Secrets of the Lighthouse by Santa Montefiore - I really enjoyed this book and Ireland itself was such an important part of the story it felt like a character itself instead of just the setting. I wanted to visit it before I read this book but it moved way up the list after reading it! 9. The Shell Seekers by Rosamunde Pilcher - I want to go to Cornwall and it's all because of this book! 10. A Voyage Long and Strange by Tony Horwitz - This is a travel book about Horwitz's journey to find out what happened here between Columbus and the Pilgrims. He goes to all kinds of random places tracking Spanish Conquistadors and I'd love to follow in his footsteps. What books have made you want to travel? And where have you wanted to go? The Guernsey Literary and Potato Peel Pie Society definitely made me want to visit as well!! The Shell Seekers is one of my all-time favorite novels. I spent a few weeks of summer in Cornwall as a teen with my English cousins, and it is a beautiful place. Reading really opens up the world--if travel to a setting isn't possible, then armchair travel is the next best thing. Yes, I love books set in interesting places. I feel that I've traveled all over the world through the mystery genre. It's a special thing when an author can almost make the setting a character. Peter May's Outer Hebrides books spring to mind and Tony or Anne Hillerman's books set in the Four Corners region of the Southwest. I want to go to so many of the same places, although I have been to Ireland but would go back. I have to say to me so many places in the USA seem so inviting in books although again I have spent time in Spokane and LA and visited Chicago. But you don't see much in one visit!! Definitely a unique list, I have Lowcountry Bookshop on my wishlist!! I haven't read any of these books but I do often wish that I could visit some of the places that I read about. I really want to spend some time in the lowcountry because of all the novels I've read set there. The bug to travel to Tuscany bit when I read Under the Tuscan Sun. Still haven't made it there - except via books. Eowyn Ivey makes me want to travel to Alaska... I find I'm more drawn to colder climates when it comes to armchair travel, as opposed to hot beachy type destinations. Great list! Our bucket list is very long, but Italy, Ireland and England are all our list. I agree about the Tuscan child, I wanted to visit there. Same with the Bill Bryson book, made me want to travel England. Shell Seekers is one of my very favorite books.